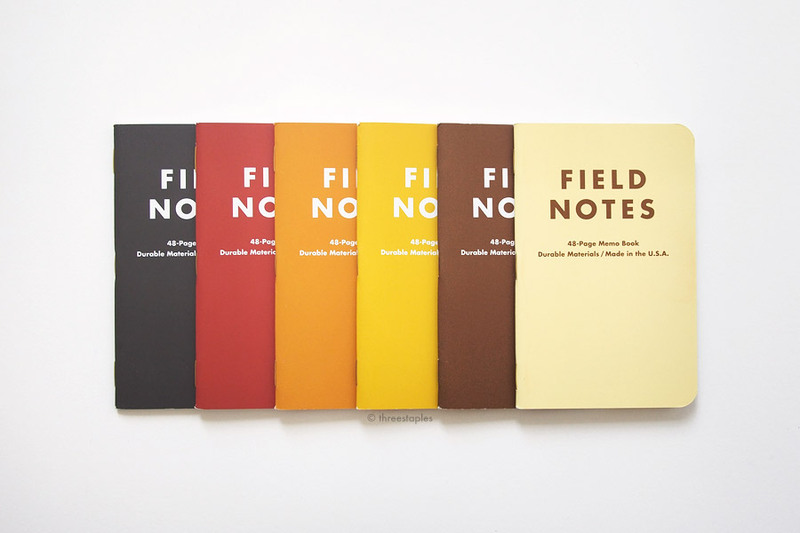 Drink Local is the Fall edition of Field Notes from 2013, 20th in the COLORS series. 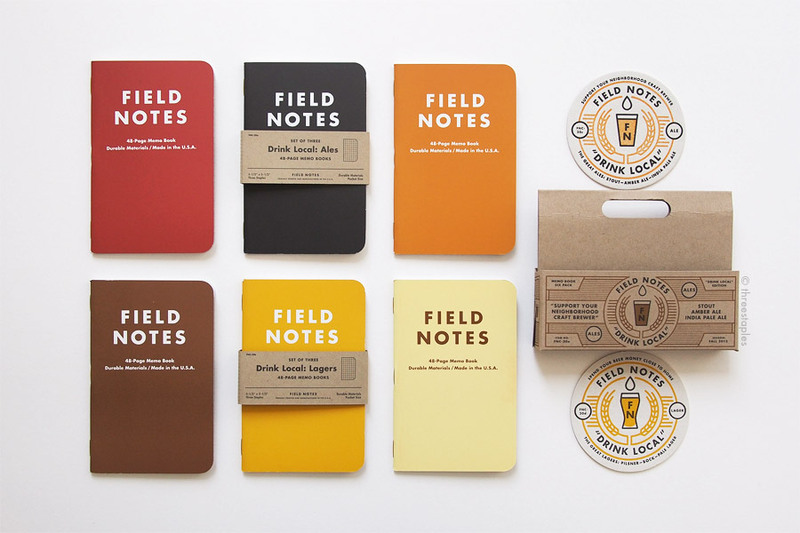 It was born out of Field Notes’ love of beer and features 6 different memo books, in a range of colors from pale yellow to dark brown-black, each representing a different brew of beer. Added on the back of each cover is a brief history of each type and an awesome Draplin-designed logo of a beer glass. Interestingly, Drink Local came in two different 3-packs, one for Ales (Stout, Amber Ale, and Indian Pale Ale) and one for Lagers (Pilsner, Bock, and Pale Lager). 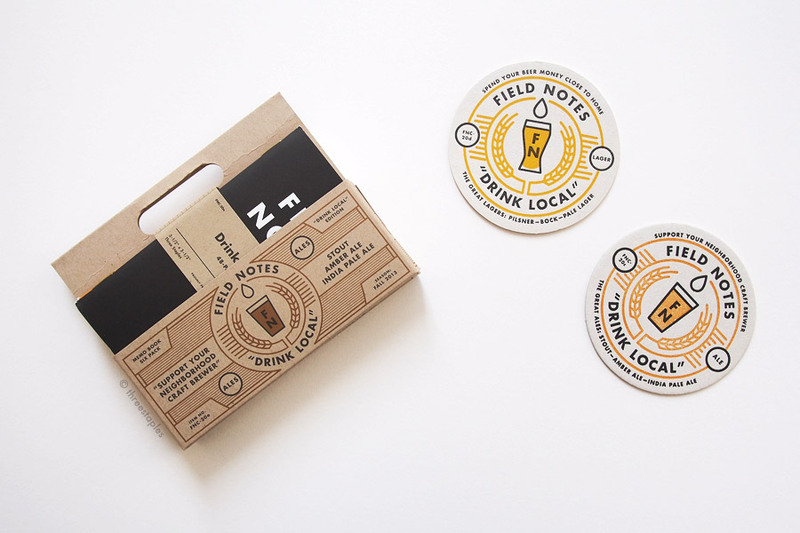 Drink Local “Ales” (left) and Drink Local “Lagers” (right) with matching letterpressed coasters. From left: Stout, Amber Ale, India Pale Ale, Pilsner, Bock, and Pale Lager. 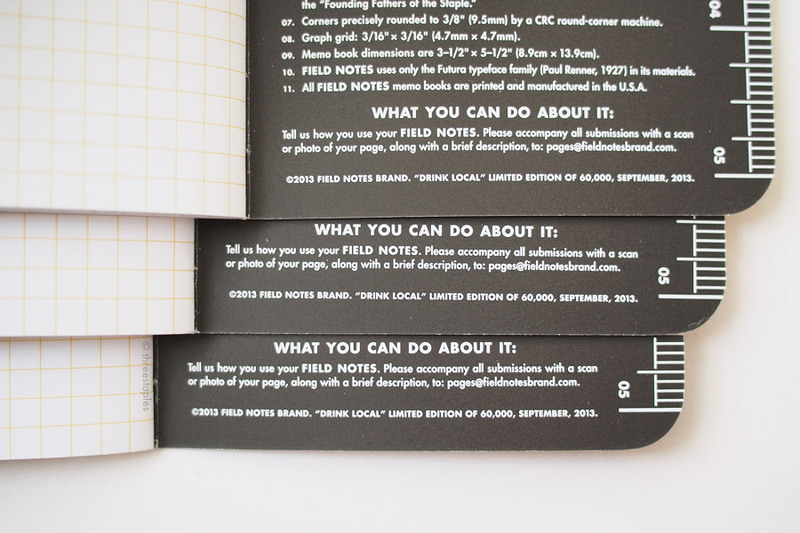 I know I’m going to shock some of my fellow Field Notes fans but Drink Local is not one of my top favorite Field Notes. 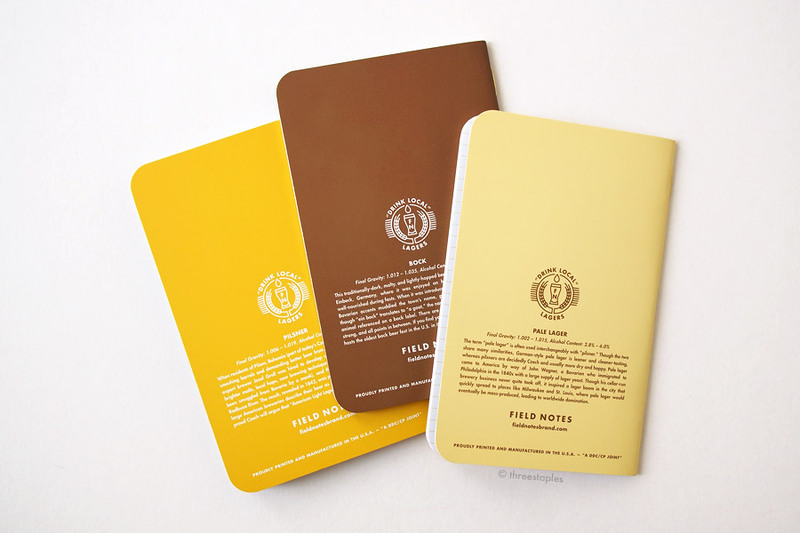 As a memo book, it’s perfectly fine, as I’m comfortable writing with gel pens on its 50#T Finch Paper body paper. But I find the yellow color “Hefeweizen” used for the graph grid a bit overwhelming, and am not a big fan of the “soft-touch” varnish (more on this later in the post). Thematically and design-wise, I think it’s a solid edition, and even though I’m not much of a beer drinker, I find the local craft beer theme really neat. 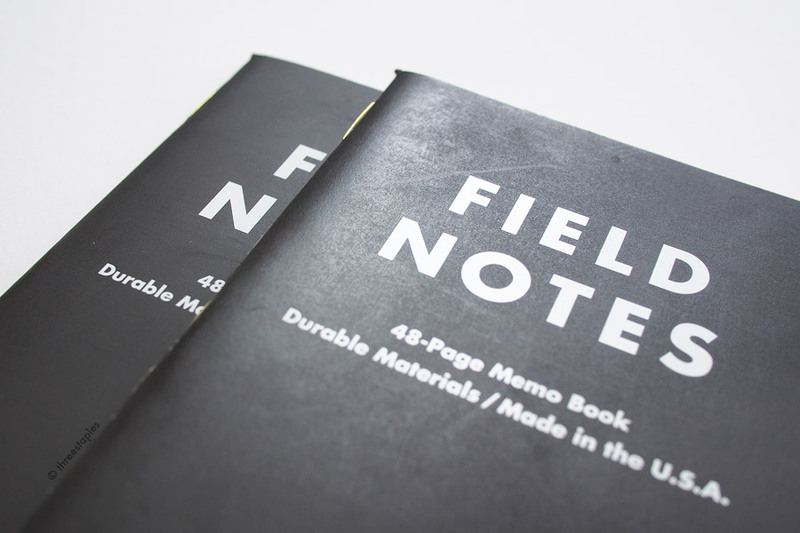 And as always, I appreciate all the details Field Notes put into this edition, from the bold combination of rich colors and the contrasting glossy varnish on the logotypes, to the extra texts and edition-specific graphics on the back covers. Not to mention the gold-colored staples! 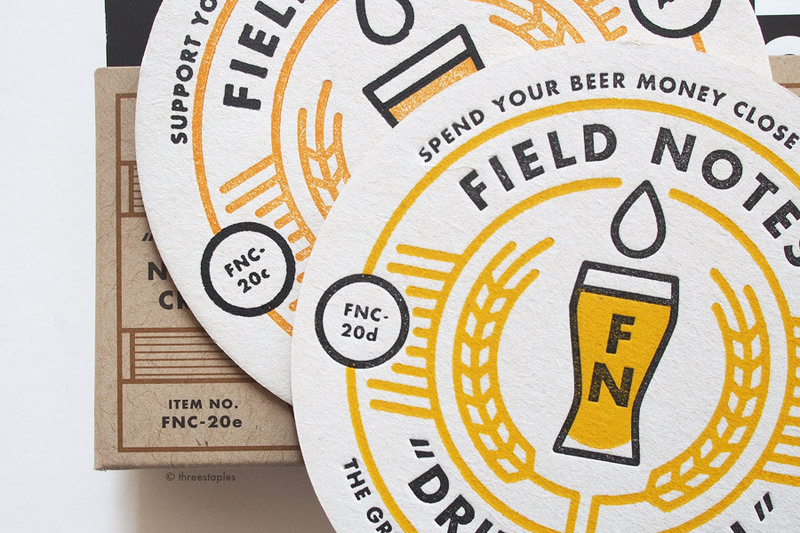 And the thick, hand-letterpressed, pub-style coasters that came packaged in each 3-pack! 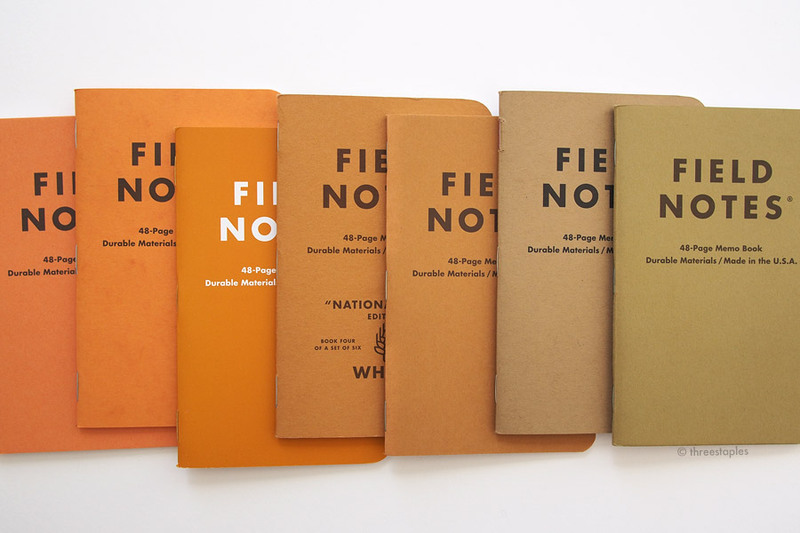 Even so, there are so many other Field Notes with matte covers that I like better, that Drink Local unfortunately gets pushed fairly low on my FN ranking. Doesn’t mean I hate it or that I don’t enjoy it though. Quick graph grid comparison (from top): Drink Local, slightly lighter yellow in Packet of Sunshine, and light brown in Original kraft. I find the yellow grid in Drink Local a bit saturated for writing but I enjoyed using brown ink on it. The 6-pack carrier was a subscribers-only extra that I tracked down much later because I was not subscribed at the time Drink Local was released. It features the same beer glass logos found on the coasters and on the back cover of the memo books. Proper item numbers: FNC-20a for “Ales” and FNC-20b for “Lagers”. And for the extras too! FNC-20c, FNC-20d, and FNC-20e. Glossy varnish on the logotype. It's used only on the front. Also, Pale Lager (pale yellow) is the only book where they used brown ink for the logo and texts; all the other books are white (probably the white of the paper). I understand why they went with brown for Pale Lager but wish it was the same as the other books. 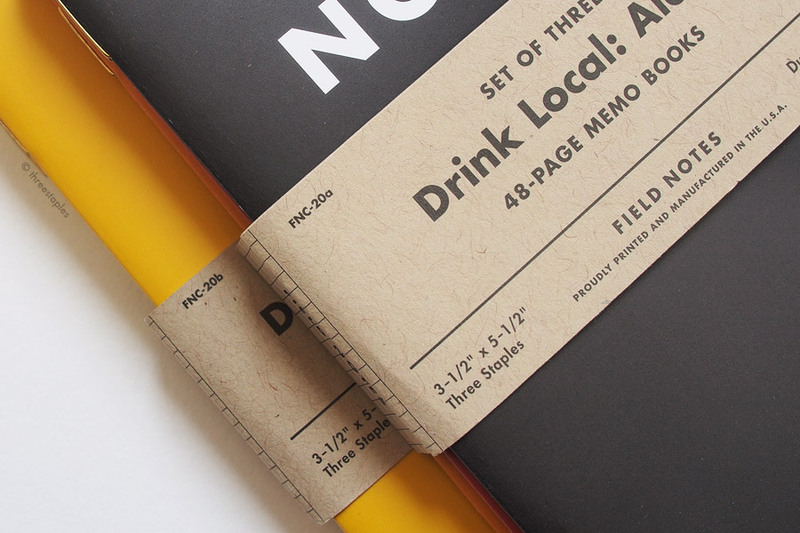 Drink Local is the first in Colors to get the “soft-touch” varnish on the cover that makes it feel soft and almost rubbery, in contrast to many of the previous Colors editions with matte covers. The next quarterly edition to get the “soft-touch” treatment is Unexposed, another fall edition a year later in 2014. Drink Local uses New Page Sterling Premium in 120#C as its cover stock, the first time (and the only time so far) we’re seeing it in Colors, while Unexposed uses Sappi McCoy. 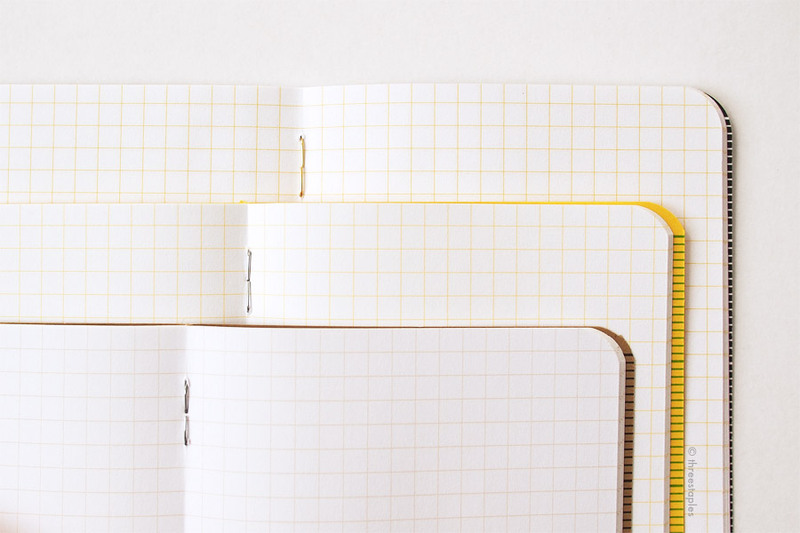 Despite the coating, since the cover is white with colors printed on it, the white of the paper can start showing through when it gets scratched or worn down over time, especially at the edges. Used vs. new: Amber Ale (left set) and Bock (right set). Used one is on the left of each set. 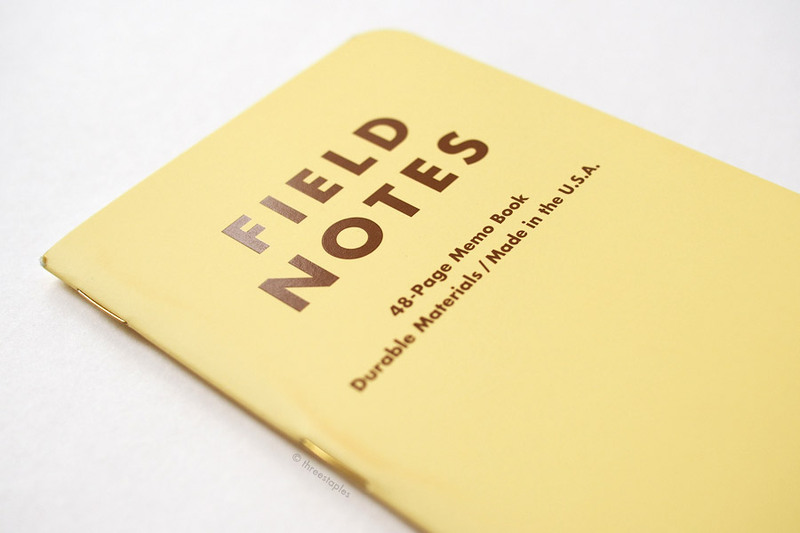 It seems many people love this type of “soft-touch” cover because the coating renders the memo book more durable overall and resistant to moisture. Like I mentioned, I’m probably in the minority of people that don’t love this type of cover. I think it’s okay but the varnish seems to change colors as it ages? I’m not exactly sure which part is changing but some of my used books look noticeably different from their new counterparts, and there’s an uneven, green-ish tint that makes them look dirtier. That’s probably the most negative thing I can say about Drink Local. Bock: used one is on the left. Stout: used one is on the right. It's hard to see it but two of my Pale Lagers also suffer from brown-ish “stains” down the length near the spine on the front. Amber Ale: used one is on the left. Btw, Drink Local is not the first edition in Colors there are extra texts and edition-specific “branding” on the covers. National Crop and County Fair are examples that precede Drink Local. Gold staples. They have tarnished a bit over the years but they still look good with all the colors. Another major “first” in Drink Local: gold-colored staples! 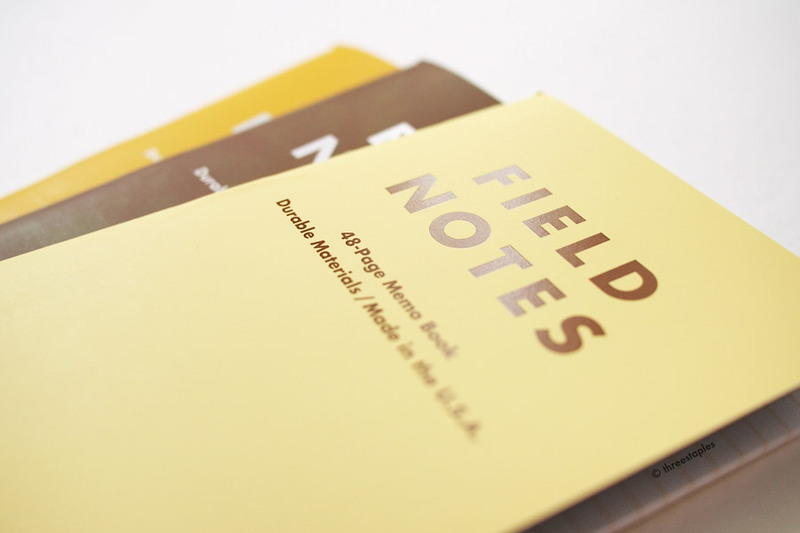 It was probably a no-brainer for the Field Notes team to go with gold staples, considering the warm colors they chose for the covers. The next quarterly edition to get the gold staples is Shelterwood (Spring 2014), which is only a couple editions after Drink Local. Two different belly bands for one edition! 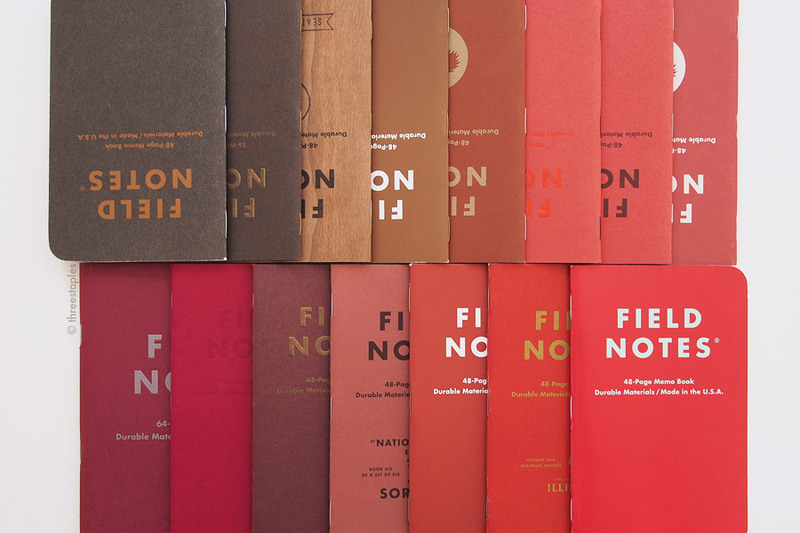 As for the way it was packaged, it’s not the first time a quarterly edition consisted of 6 different books but unlike the boxed edition National Crop (Spring 2012), Drink Local is unique in that it was packaged as two distinct 3-packs, one pack for Ales and one pack for Lagers. So as a non-subscriber, you could choose which pack to buy, while subscribers received one pack of each type. No doubles. The coasters came packaged inside and shrink-wrapped with the memo books, similar to how the extras in America the Beautiful and Fire Spotter were packaged. 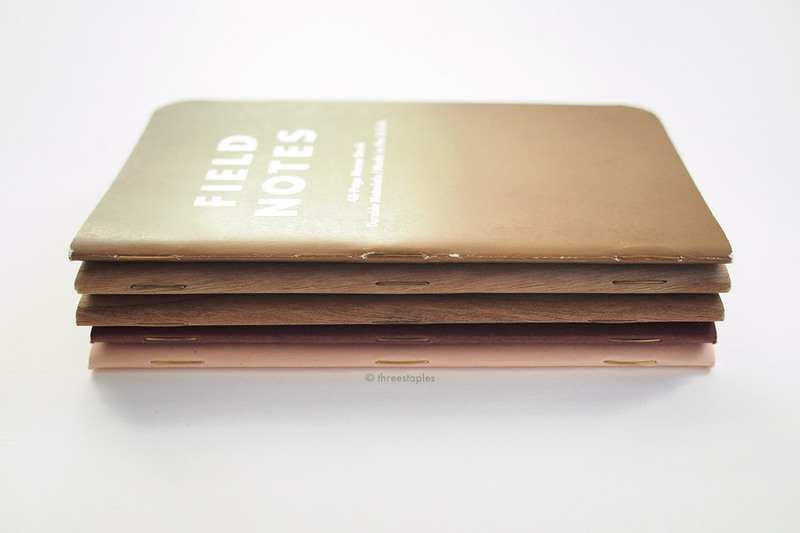 “Chipboard” belly band is lighter than the kraft paper used in Original Field Notes. Inside of every book is the same dark brown-black color found in “Stout”. Not every pen works on this inside cover because of its color and texture but I was able to fill in the dates using a white Posca marker. Quick note on the edition size of Drink Local. It’s 10,000 of each type of 3-pack, meaning 10,000 packs of “Ales” and 10,000 packs of “Lagers”. Total of 20,000 packs. Or 10,000 books per each type of beer. Night Sky, the quarterly edition right before Drink Local for Summer 2013, was 15,000 packs. Cold Horizon, the following edition in Winter 2013, remained the same at 20,000 packs. Interestingly, on the back inside cover of Drink Local, it says “60,000, September 2013”. That’s 60,000 books altogether. Look how thick the coaster is! The coasters were also available for sale separately from the 3-packs but they're now sold out. Drink Local is the 2013 fall edition of COLORS, the 20th in the series. Item Number: FNC-20a for “Ales” and FNC-20b for “Lagers”, as printed on the belly bands. Priced at $9.95/pack. Collectively FNC-20. Edition size: 10,000 packs of “Ales” and 10,000 packs of “Lagers”, September 2013. Covers: New Page Sterling Premium 120#C “Dull” printed with six unspecified soy-based Toyo inks with an overall “soft touch” varnish and gloss-varnished logos. Extras: 3.5"-diameter 2-color coasters letterpress-printed by hand in Chicago, by Liz Isakson-Dado, who bought letterpress equipment from Dan Barron of Flywheel Letterpress (he printed FN editions like Raven's Wing and Fire Spotter). Learn how these coasters were printed by reading this or by watching the 2013 recap video. 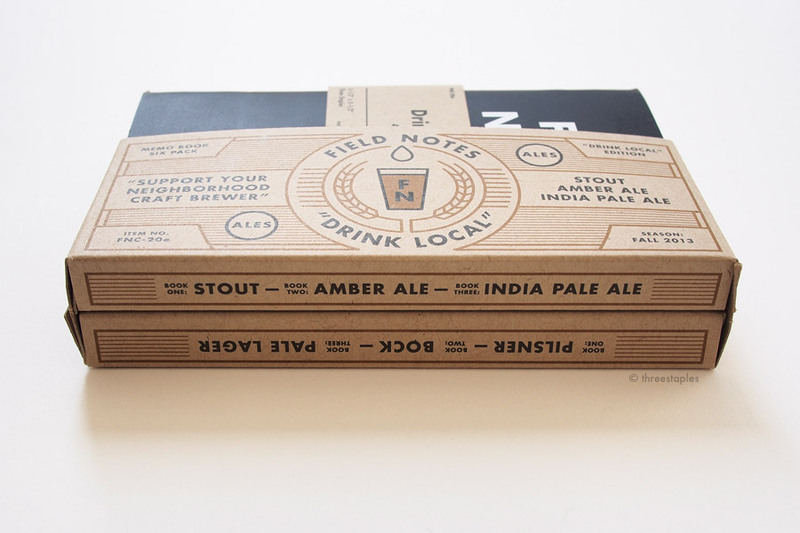 Subscribers-only extra: FNC-20e “Ales & Lagers 6-Pack Carrier” made with what looks like the same paper used in the belly band. 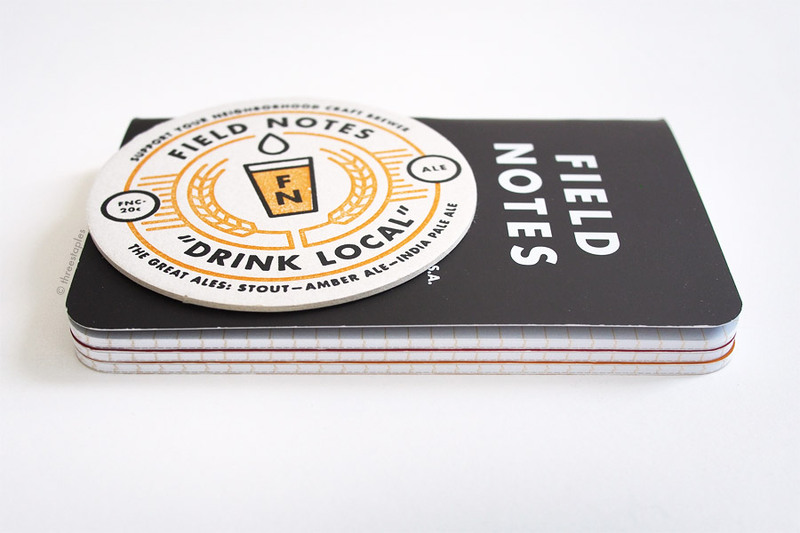 Film: Field Notes: Drink Local Edition (on Vimeo) featuring the voice of Jim Coudal. Quick color comparison. Top row (from left): Nixon (2015), Ambition, Cherry Graph, Drink Local “Bock”, Tournament of Books (2016), Sweet Tooth, Mackinaw Autumn, and Tournament of Books (2015). Bottom row (from left): Arts & Sciences, Red Blooded, Ambition, National Crop “Sorghum”, Drink Local “Amber Ale”, County Fair, and Starbucks Reserve Coffee Origins “Africa”. Quick color comparison (from left): Mackinaw Autumn, Butcher Orange, Drink Local “India Pale Ale”, National Crop “Wheat”, Mackinaw Autumn, Original kraft, and Shenandoah “Red Maple”. Quick color comparison. Top row (from left): TEDx, Pitch Black, Night Sky, and Arts & Sciences. Bottom row (from left): Raven's Wing, DDC “Pretty Much Everything”, Drink Local “Stout”, Traveling Salesman, Ambition, and Nixon (2015). Gold staple editions (from top): Drink Local (notice the green tint), Shelterwood, Cherry Graph, Ambition, and Capsule (SS 2016). 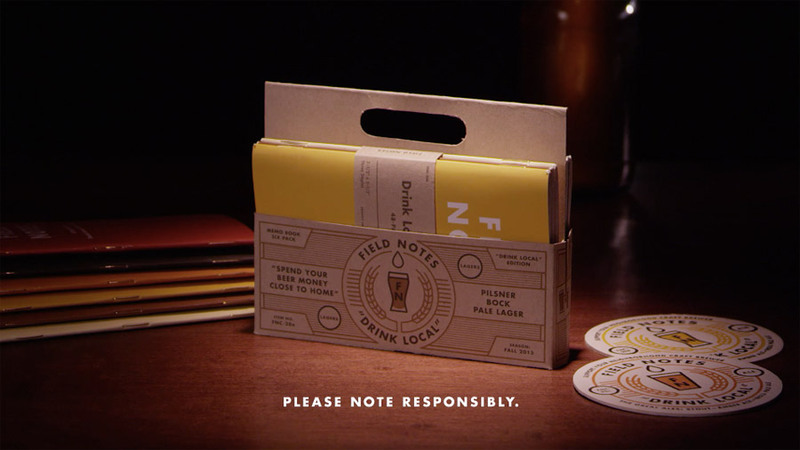 A screenshot from the official Field Notes Drink Local video. Which is your favorite book in Drink Local? I’d choose the Stout book (dark brown-black) or the Amber Ale book (warm red), despite how it ages.